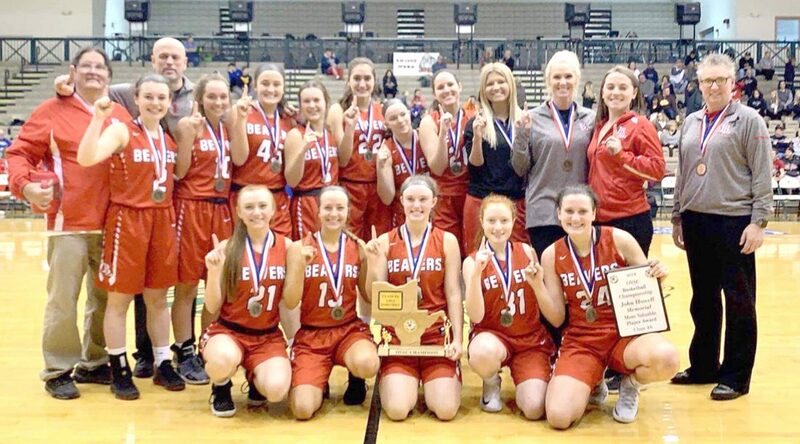 Submitted Photo Members of the 2019 Beaver Local OVAC Class 4A girls basketball championship team are (front, from left) Brooke Briggs, Madison Ours, Sydnie Holden, Alexia Harding, Jenna Riccardo; (middle) Riley Britt, Chansyn Hoppel, Leah Riccardo, Jensen Britt, Elizabeth Kolkowski, Halle Jordan, Emma Roberts, Madison Cline, coach Casey Coie, coach Lexi Merriman, head coach Stephanie Coie; (back) coach Bill Croxall and coach Scott Rogers. ST. CLAIRSVILLE — Beaver Local went into the locker room staring up at a 11-point deficit during the Class 4A OVAC Girls Basketball Championship Game. There were absolutely no panic buttons hit. The Beavers did just that and they did so by going into their unquestioned leader, Jenna Riccardo. The standout junior responded in a big way, too. She scored 24 of her game-high 34 points in the second half to help the Beavers pull out a 52-51 victory against top-seeded St. Clairsville Saturday afternoon at Ohio University Eastern, giving the school its first girls basketball crown. Having Riccardo on the interior certainly helped the Beavers (13-7) make that goal attainable. Riccardo displayed an entire arsenal of moves as she scored — and rebounded — at will. She also collected 18 rebounds. Her points and rebounds are both OVAC Championship records. Her 34 points are also a career-high. Despite the antics that Riccardo put forth, St. Clairsville had plenty of chances itself. However, the Red Devils were unable to capitalize on several chances. Beaver Local trimmed the deficit to six at the final stop by limiting St. C. to eight points and only one field goal. Beaver Local took its first lead of the game with 5:16 to go when Riley Britt drilled a 3-pointer, which came during a St. C. scoreless stretch that eventually reached 3:30 before Macy Malin converted a free throw. Rileigh Simpson buried a trey for the Devils and Malin split a pair at the line to bring the Red Devils within one at 48-47. But, Riccardo wasn’t going to be denied. She kept the Red Devils at bay by cashing four straight free throws down the stretch. St. Clairsville actually thought it had sent the game to overtime when Cassidy Stephens buried a shot from top of the key just before the final buzzer. However, the officially quickly ruled it was a 2-pointer. While Riccardo, who was named the John Howell Game MVP, was the lone double-figure scorer for the Beavers, Britt finished with six. St. Clairsville was led by Keri Klinkoski’s 18. She also had seven rebounds. Simpson and Malin went for 13 and 12, respectively. BEAVER LOCAL SCORING: Riccardo 10-1434; Britt 2-0-6; Holden 1-0-2; Hoppel 1-0-2; Ours 2-0-4; Briggs 0-0-0; Kolkowski 2-0-4. Totals: 18, 14-18 52. ST. CLAIRSVILLE SCORING: Vincenzo 1-2-4; Simpson 4-4-13; Klinkoski 6-6-18; Malin 4-2-12; Brookover 0-0-0; Stephens 2-0-4; Thoburn 0-0-0. Totals: 17, 14-18 51.